Spinal Column Radio, episode number fifteen. 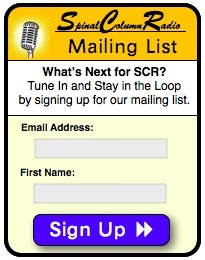 Coming up next on Spinal Column Radio — Chiropractic. It’s Not Just for Humans! Well, today we are talking about one of the most fascinating specialties, or subdivisions, in chiropractic. We’re talking about Animal Chiropractic. And one of the reasons I find this topic so fascinating, is that Animal Chiropractic is, in itself, a true testimony to the effectiveness of chiropractic as a whole. Plain and simple, Animal Chiropractic works. Animals that get adjusted don’t come to the table, so to speak, with presuppositions. 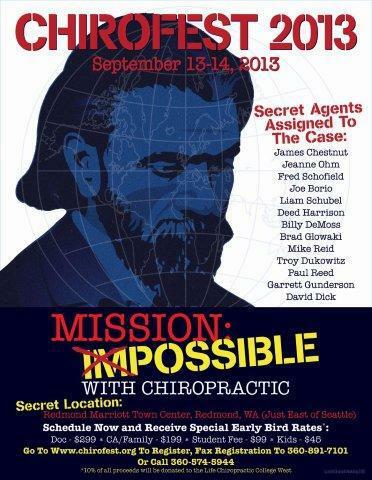 They haven’t exposed themselves to biased, sensationalized media stories on chiropractic. They haven’t bought into bogus rumors. And they haven’t fallen victim to the “Placebo Effect.” But they do have spines that are subjected to mechanical stresses and strains… and thus… they too can benefit from Chiropractic. I realize that today’s topic has the potential to draw some first time listeners into the show. So, if that describes you, we want to welcome you. 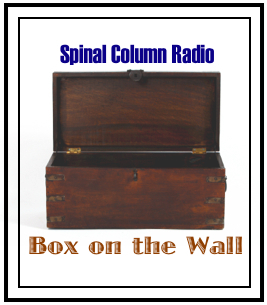 We are glad that you are here and hope that you’ll poke around our website at SpinalColumnRadio.com…. and listen to everyone of our previous shows. Better yet why not subscribe. Back in the year 2000, I authored an Animal Chiropractic newspaper article, which now resides on my SpinalColumnBlog.com website… and I’ll put a link in the show notes for that. Anyway, one of the experts that I refer to in that article is renown Animal Chiropractor, Dr. Daniel Kamen. Dr. Kamen in many ways has been a torch bearer for animal chiropractic… even at the risk of being “torched” himself. He has been interviewed over 300 times on this subject… appearing on well known shows such as Good Morning America, the Arsenio Hall Show, ABC News, Extra, Animal Planet, CBS This Morning, and The Late Show. He’s also been featured in numerous publications including the front page of the Wall Street Journal, the Chicago Sun Times, and the Chicago Tribune. But… and I may be going out on a limb here…. even with all of those interviews… I believe this is his first podcast interview… And so now, Dr. Kamen can proudly add to his interview resume… SpinalColumnRadio. Dr. Lamar: All right. Joining us on the telephone today from his practice in the Greater Chicago area is renown Animal Chiropractor, Daniel Kamen. He’s been involved in Animal Chiropractic since 1981. He’s authored three books on the subject and teaches Animal Chiropractic methods to Chiropractors and Veterinarians across our great nation and internationally. Dr. Kamen, welcome to Spinal Column Radio. Dr. Kamen: Thank you. Good to be here. Dr. L: Okay now for some of us listening right now, they’re a bit confused… Animals can get adjusted? Really?? Do you encounter that a lot? Dr. K: All the time. That’s the whole point. In fact, a lot of people encounter that. I’m not the only one who does it. You probably know that. There’s several groups that also teach that. There is the American Veterinary Chiropractic Association, the Parker College of Chiropractic. A lot of different places. But yes, they have spines. They have needs. They have pinched nerves. They have musculo-skeletal problems just like everyone else. Especially if they’re athletic animals like horses and racing dogs. So, therefore, they need to get adjusted quite a bit. Dr. L: Ok. So, if I’m a pet owner… now I’m kind of going “This is interesting.” What would tip me off that Fluffy or Rover needs to have a spinal adjustment? Dr. K: Ok, for a dog it’s the way they move about. You’re not going to notice a lot of visceral problems as probably, as possibly, a chiropractor would encounter maybe in his human practice. What dog owners notice is things like they can’t do. Like, they can’t jump up on the couch as easily or sustain a trot or run for a long time. And other things that are more like medical problems, veterinary problems like hip displacia. They may notice something like that and therefore instead of having surgery they want to know if there’s another way that they can treat it. Also, bladder control problems is a big one. There is a great chiropractic technique for dogs who have a bladder control problems. In fact the Logan Basic… you are probably familiar with the Logan Basic Technique. Dr. K: It is really not Logan Basic Technique which treats bladder control problems. It is a point similar to that. In fact it was one of my patients who discovered that it worked about 25 years ago. Dr. L: Speaking of schooling, you are a graduate of the Palmer College of Chiropractic. Dr. L: Which is where chiropractic was birthed and if I am correct, isn’t that where you got your first taste of Animal Chiropractic? Dr. K: Yes. Dr. Gilbert Schmeidel and he taught Neuroanatomy. He was sort of like the Darth Vadar of the school. People feared him. I don’t know why. He, of course, wasn’t really that tough but he taught Neuroanatomy and he also used to adjust dogs in his private office. And once in a great while, if you were walking down the hallways at Palmer, you would hear a very strange primortal scream coming out of his office. You were hoping it was a dog being adjusted and nothing else. It could have been a student who had a bad grade. Who knows. But, anyway he used to do that and that was my first experience with it. But, I didn’t get interested in it then we just knew that there was a teacher, Dr. Schmeidel, adjusting animals and people used to bring them in. First of all, he is still there. I don’t know how old he is. I think he built the Pyramids, I’m not sure. He’s been there for a long time. And the school recently, or relatively recently, like in the last 10 years told him that he could no longer do that because of the state laws. They are not allowed to adjust the animals cause they have the student human clinic there and they were getting some flack about that. Dr. L: We’re going to get into that a little bit later. Dr. L: That’s when you first got your first taste of Animal Chiropractic. Dr. L: How did you get training from then on out? Dr. K: Well, first of all in 1981 there was no organized course in animal chiropractic. There were people who were doing it, chiropractors that you had to find. My first real interest in it was when a human patient of mine, back in ‘81, wanted me to adjust her horse that she had at Arlington Park Racetrack. I was so hungry for patients at the time. I asked her if she was going to pay me to do it and she said “yeah.” “Well, I’m there,” and I was way over my head. I’m not an equestrian. I had very little experience with horses. The only thing that I had going for me was that I wasn’t afraid of them and I was already a chiropractor. And so, I went over to Arlington Park Racetrack to adjust one of her horses and I essentially made up a move. And that was it. I mean, in fact, on the way to the track I had a horse anatomy book between my knees between stop lights I would read this. I’d go “…a horse has 18 thoracics? No kidding?” You know? And I went there and I pushed on something and low and behold there was… it was an act of God but the horse improved and then I got referrals from that. Dr. L: Oh that’s a funny story. Learning on the way huh? Dr. L: Yeah, no… trying to transition your human anatomy over. Dr. K: In fact the withers, the first 7 thoracic vertebrae are almost a foot down as far as their spinal nerve roots and so it’s almost impossible to get any appreciable movement there. The most you can do at that point is just do some muscle work surrounding it. Dr. L: So, it’s mostly mechanical restriction that you are trying to free up? Dr. K: It’s a mechanical restriction, that’s right. Dr. L: So now you’ve gone from that and now in many ways you are the teacher, if not a leader, when it comes to Animal Chiropractic. And you have authored some books — and we are going to talk about those pretty soon — but I want you to retell another story out of one of them because, at least from my perspective, it seemed this was somewhat of a pivotal achievement for you not only as a confidence builder perhaps but also in realizing just how much chiropractic can impact the health and function of an animal. Can you tell us the story of Little Tom Tom? Dr. K: Yeah! Little Tom Tom was… this goes way back. It was just someone that I met, like a trainer… like a washed up trainer at Arlington Park Racetrack who never really had a winner. And he had like some, you know some rather slow, cheap horses to train. And he had one horse that had some potential but didn’t… but never reached it’s potential. And I was just there goofing around, really just you know feeling my way around the track. And I asked him if he wanted to have his horse worked on, and he agreed. I didn’t charge him anything for it I was just more or less curious to find out if this was going to work. You know on a horse, on a race horse that qualified for a race but never really did much. And I adjusted the horse and the horse won. I don’t know if it was because of me or whatever but that was it. And I was inspired at that point. You know, I hear these stories a lot where a race horse is adjusted and it wins. The horse has to have talent to begin with. You can’t just take any horse and work on them, you know, and make them a winner. The purpose of the adjustment is to restore normal joint function and if that’s all he was lacking and that’s enough to put him over that’s fine. You know. But that’s what happened. And, you know, although he wasn’t my first patient. He was… I had had several before that but he was just one of the trainers that I sort of like, I kind of felt sorry for the guy. He didn’t have any money and then he died, by the way, shortly thereafter. I didn’t work with him for many years. He died like two months after that. He had cancer. Dr. L: Ah, that’s too bad! Dr. K: That goes back 30 years ago. Dr. K: Yeah, I kind of already knew there was something there. It’s just that at the time… at the time to convince horse trainers and on a thoroughbred track to have you know to give you to have them give you their horse when it’s really kind of an unknown. It was rather a challenge back in those days because people didn’t know about it. Ah, some did. You know in fact it was more popular on the standard bred tracks like the buggies. You know you’ve seen like the harness racing. Those are more hands-on owners. In fact a lot of times you’ll find in a harness track like a standard bred track, you know if the owner/driver/trainer you know he does everything with the horse. It is more hands-on and he is willing to try anything. In a thoroughbred they had detached owners. The trainer may be willing to try something new but you also have to clear it pass the owner as well. So it’s not as easy on a thoroughbred track. Dr. L: When was it that you said to yourself “Hey maybe I could teach this stuff.”? Dr. K: Well, let’s see… well you know that occurred when I finally knew enough to teach. I mean it’s not easy to do that because first of all there are so many styles of chiropractic and you also have to… you have to find an audience. I mean chiropractors already know. I already was certified by the American Veterinary Chiropractic Association when I started giving seminars on a regular basis. I had taught various people… you know single people one by one… You know just one at a time how to do a few moves. But I didn’t have anything organized until my brain was organized in such a way where I can teach the technique safely. And that was the key because early equine chiropractic was done with mallets. And that’s not safe. And all the techniques that I teach are done without mallets … just using your hand. So as soon as I found a group of moves which I can easily relay to everyone without hurting the horse that’s when I started teaching. Dr. L: Because there was a time in the early days of chiropractic’s history that it actually was part of the formal curriculum. Talk a little bit about the early days with D.D. and B.J. at the Palmer School of Chiropractic and what you know about their animal chiropractic curriculum. Dr. K: They had a program called “The Doctor of Chiropractic Veterinary” and a certificate which they gave out for like a 1 month course they taught at the Palmer School of Chiropractic it was called at the time, Palmer School of Chiropractic. B.J., more than D.D., but B.J. Palmer was famous for adjusting all kinds of animals, in fact exotic animals. There is a story where he… and I don’t even think it’s true… where he used a mallet, like a hammer, to adjust an elephant… and he cracked it’s neck or whatever you know and it didn’t end well… but I think that was more of a apocryphal story than anything else. But they wanted to branch out. They wanted to actually prove a point that chiropractic was not just a theory or something which acted as a “Placebo Effect.” They wanted to show that it had a real effect where they would take an animal and animals don’t have any preconceived notion about what is going to happen and if they can adjust it they will improve anyway. And that was really their point. That was shut down incidentally. That was done in Davenport, IA. Their program was shut down because they ran a school for people and the state wanted to know “Well, are you a veterinary college or are you a human college?” And at the time most states were not licensed. Most states did not have chiropractic licensing boards. And they were struggling at the time to get human acceptance. And that was like in the early teens and then later teens. So even then politics got in the way and they shut it down because of that. So for many years it was just on the fringe, and it was up to the individual practitioners to carry the ball and do it themselves. And that’s why it was never organized until recently. Dr. L: Ok. That’s very interesting. I didn’t know all of that. So, then to get back to the original question, why don’t the chiropractic schools of today teach it? Dr. K: Well, actually one does now. That’s Parker College of Chiropractic in Dallas, TX. In fact, I would say the foremost authority in animal chiropractic today is Dr. Gene Giggleman. And Dr. Gene Giggleman, and it sounds like I’m making a joke but that’s his real name… Giggleman. G.I.G.G.L.E.M.A.N., Parker College. He is a doctor of veterinary medicine. He is a D.V.M. And Dr. Giggleman also teaches anatomy at Parker College and he has for many years and the last… I’m not sure of the number, maybe 8 years, has been the head of the Animal Chiropractic program there. And so he is a Veterinarian on the forefront of Animal Chiropractic teaching. And so they are now, but it’s still not a licensed profession. There is only one state that I know of, Oklahoma, that recognizes any postgraduate Animal Chiropractic certification. Like, in other words, if a Chiropractor wants to do it independently of a Veterinarian in Oklahoma then they would have to be registered and have taken that course. Dr. L: So, the laws really do vary from state to state. Dr. K: They all vary. There is no federal law. They’re all state laws and not only do they vary, the veterinary boards have to match with the chiropractic boards. For example if a veterinary board says it’s ok for a chiropractor to adjust animals that’s fine but maybe it’s chiropractic’s state board says it’s not ok. So therefore the whole thing is a wash because therefore they can’t do it then. So both boards… both sides… both boards have to agree it’s ok in someway. Dr. L: So, it’s really a mixed bag. Dr. K: It’s chaotic! It’s totally a mixed bag. Dr. L: And sometimes the laws don’t even make sense. Dr. K: Um, yeah. For example, one of the things which doesn’t make sense to me — in my early days I used to be a smart alec, you can’t tell anymore….They said that in Illinois — this was back in ‘81 — that you have to have a license to work on animals. Well the only license that I can get readily at the time was a hunting license. Apparently it’s ok to shoot a deer’s head off but you can’t adjust it’s neck. See. Dr. L: That doesn’t make sense. Dr. K: That doesn’t make sense. That’s a perfect scenario were it doesn’t make any sense. You can hunt animals. You can kill them if they’re in season. The problem is that dogs and horses are never in season. So one time, I did this thing just for the Press, I said, “Well I have a horse here. I’m hunting it with my hands. I have delivered the ‘fatal adjustment.’ I’m just waiting for him to die of old age now.” And that did not wash with the board. I’ve had my share of problems with them, but I’m still licensed. Dr. L: You are still licensed. Dr. K: I’m still licensed. Dr. L: Why do you continue to teach this at the risk of perhaps sometimes getting arrested? Let alone being fined and, who knows, having a cellmate named Bubba. Dr. K: Yeah well you know I tell you I can get some peace and quiet if I were in jail. I can get a lot of reading done… probably. In fact that almost did happen. I would say 4 or 5 seminars, I was in Minnesota about — this was not too recently maybe 7 years ago, 8 years ago or so — and I had forgotten that I had a Cease and Desist Order from the state not to do any seminars in Minnesota. I mean I had gotten several of them.. I forgot which ones I got. So I still do the seminar. I have a lot of people there and the sheriff came in 2 minutes before the seminar. I had like 25 – 30 people there, and he says, “You can’t give this.” He gave me a piece of paper and you know “I’m just a messenger. If you are still here when I come back you’re under arrest.” And I thanked him for giving me a fair warning and we went someplace else and did the seminar. Dr. L: Oh man. Wow you are bold. That’s fantastic! Dr. K: Well we went — I’m not going to say where — but we went to a different place…. It could have been in a neighboring state. I’m not saying it was or wasn’t…. But, we had the seminar and everyone was happy. Dr. L: You got the job done. Dr. K: Got the job done, yeah. Dr. L: …and what I mean by this is that there are state veterinarian boards that would love to shut you down. Dr. L: …for teaching your courses. And some states have completely banned you. Dr. L: As a matter of fact you’ve had to play “musical barns” a few times with your horse seminars. Dr. L: Do you still have to do that? Dr. K: I haven’t done that in a long time because now I’m a little bit more careful where I pick the states. What I do these days, and I have for awhile now, is that the states really don’t bother you as long as you have a supervising licensed, state licensed, veterinarian in attendance. And that actually will satisfy most states. And I do. And in fact a lot of my registrants, well not a lot anymore, but you know a fair number of registrants are licensed veterinarians. So they’re there. And they’re right there. I mean they’re not a phone call away they are exactly at the seminar. So, that seems to have solved most of those problems just by having that …and then in fact that solves most of the chiropractor’s problems too… if they want to practice and they need a veterinary referral then and if they have one, and the state knows that they’re working with a licensed veterinarian… well then that again solves their problems as well. Dr. L: Very good. You know, back in 1996 I had the privilege of attending one of your seminars largely because the topic fascinated me so much. Dr. L: And you said something that I haven’t forgotten. You said that “Animal Chiropractic is stuck in 1895” — which is the founding year of our profession. Dr. L: Do you still stand by that or have we advanced a little bit? Dr. K: Oh! It’s a lot more advanced since then! Quite a bit more. Because there are so many places now that teach it — and openly teach it. Now, by that time when I said that the laws were still pretty much, as I mentioned before, chaotic. And they still are. But the schooling and the education has greatly increased. In fact, it’s not just the U.S. that teaches it. There are places in England, Australia, Canada, and that’s all I can think of right now, that teach a course in Animal Chiropractic. Colleges, not just like weekend courses. Colleges that teach it. There was a place in Melbourne, Australia that taught it for a while as a master’s degree program. So, to say that it’s “stuck there”… maybe the laws are in certain states but not the education. Dr. L: That’s really good to hear. That’s actually very encouraging. Another thing that I remember about your seminar is the number of animal bones that you produced out of your suitcase. What’s it like in the airports with all that security nowadays? Dr. K: You know, except for the lumbar spine in a horse… the lumbar spine has a really long, narrow, flat transverse process and if you carried a piece of sandpaper with you, you could fashion it into a formidable weapon. But as long as it’s a bone, they don’t, you know, bother me. As long as it’s not associated with a cup of coffee. You know coffee they don’t allow but a bone that looks like a knife is fine. The thing which they don’t like…. I have actually a plastic horse that I also take along with my real ones. And there is a metal, kind of like a cord that goes through the cervical spine to keep it together. That’s the only thing that shows up on the x-ray detector. Dr. L: Oh that’s interesting. Dr. K: So they ask me to take it out and I show them that it’s a flexible plastic horse spine and then they say fine. The thing which… that actually…. what doesn’t go through very well, and I only use these sporadically on dogs, are the Activators. The Activators are all metal and it looks alien, you know, to anyone who has never seen one. And so I have to explain it to them because it’s a big hunk of metal. The only thing that really doesn’t go through very well the x-ray detectors. Dr. L: I’ve had the same experience. Dr. K: Yeah. You have to produce your license or at least a business card. Dr. L: I’m sure that you’ve received a little criticism from some for having produced such… well basically in a sense a chiropractic “how to” book. But your initial rationale for authoring these books was really more of a defensive move on your part against the laws that just didn’t make sense at that time. Can you tell us more about that? Dr. K: Well yes, because of one thing. A lot of chiropractors still cannot adjust animals and even if they are certified they still cannot… so if a horse owner or dog owner, for example, wants their animal to be adjusted there’s no workforce. So the only other choice is to have for them to do it themselves. See the states tie the ones who are professionals. They tied their hands. So, if you are a licensed professional chiropractor, you’re not allowed to do it. But a horse owner, or a dog owner, could do anything they want. So their hands are not tied with their own animals. In fact, most horse owners are their own veterinarian for a lot of different things. They administer drugs. They do small suturing. You know stuff like that. They do some of their own trimming for the feet and so forth. So most of the horse owners take care of their horses like that to begin with — not so much dog owners, but horse owners. But t hat’s the reason though, because chiropractors are not allowed to do it. So therefore, you know, the animal owners have to do it themselves. Dr. L: Ok so that was the rationale for writing it, but now over a decade later you’ve seen some changes. Have you noticed… do you feel your books have made any sort of impact on these laws? Dr. K: On the laws… you know it’s hard to say. I really don’t know the answer to that question. I mean whether or not they do or not, we know maybe the states are thinking “Well gee, you know maybe he has something there. Maybe we should put it in the hands of the pros instead of the lay people.” The moves that I teach, though, are not dangerous. I think one of the most absurd comparisons that I get a lot — in fact I get these a lot in phone calls and emails from my critics — they’ll say, “Well, Dr. Kamen is teaching Animal Chiropractic — What’s next brain surgery?” You cannot equate the two. There’s, you know, the moves that I teach are safe to do. It’s not complicated. I mean the moves that I teach are not complicated. They’re not dangerous. The only thing dangerous about adjusting if you’re not really skilled in it right now is… not so much the moves itself… is not knowing when to refer to a vet. Chiropractic cannot cure everything, so therefore you may think it’s a chiropractic problem when it’s a veterinary condition. So you have to know, that’s the big thing… you have to know when to refer out to a licensed veterinarian. When is it not a chiropractic problem? When is it a medical problem? Dr. L: Very good. You know, out of curiosity, out of the three books you wrote which one has been the biggest seller? Dr. K: Horse, by far. Tens of thousands of books. The cat book is the worst seller. The cat book has been out for maybe ten years and they have sold maybe six thousand copies. Dog book maybe fifty thousand copies. Horse book probably closer to a hundred thousand copies worldwide. Dr. K: And the cat book, the reason why it doesn’t sell, first of all… you have to be, you know most of my injuries have been with cats and small animals. You know, cats don’t like to be picked up by their… you know I should have called it How to Adjust Your Cat and Seven Other Martial Arts. You know it is… it could be dangerous trying to adjust your cat. A lot of problems… you know cats have fewer musculo-skeletal problems because they have quicker reflexes than dogs do. Dogs, you know, dog owners you know there’s more you can do with a dog. There’s hunting dogs. There’s racing dogs. You know, I suppose you could let cats race but they wouldn’t be controlled. So more can happen to a dog and that’s why that sells better than the cat one. Dr. L: Obviously your animal choices for these books was not by accident. You know, when it comes to animal adjusting the three biggies are dogs, cats, and horses. Dr. L: But as you stated in one of your books, the only animal that can’t benefit from animal chiropractic is a dead one. Dr. L: Suppose you had to write two more similar books on the subject, which animals would you choose? Dr. K: Well, if I… I mean if I wanted the book to sell or not to sell? Animal Chiropractor, Daniel Kamen, D.C, takes chiropractic to new heights! Dr. K: Well, ok, on a serious note actually there is a need to write a book on how to adjust exotic animals. I don’t have a lot of experience with exotic animals. I have some. I’ve adjusted a giraffe and a lion a couple of times. But that was it. Zoos seem to be… zoos seem to have an interest in that…. and people… in fact there are chiropractors right now that only work in zoos and adjust exotic animals. So that’s that. If I had to write the Well Adjusted Giraffe, I would tell them not to do it. In fact that was one of my first P.T. Barnum moments of my life where I sought out a giraffe, the “Mt. Everest of Spines” and I wanted to adjust it. And I found one in Cape Girardeau, MO. Thank God it was well before Rush Limbough was noted. He probably would have torn me apart with that one. But the giraffe almost did. And I climbed up a ladder and there were news people there you know. Not because of me. They were watching a lion, actually, getting his teeth cleaned. And they were filming them then they trained their camera on me…. and the giraffe swung me off his neck. I tried to do like a… wrap my hands around the giraffe’s neck . Giraffes aren’t used to having anybody up there with them, you know, and he got really nervous. And he swung me off the ladder and three different times I landed in the hay which the owner of the barn, of the 5H Animal Barn… ranch set out for me. And that made it on the T.V. news and four months later it made it on American Airlines and United Airlines as the two reel of the thing… of the “Stupidest Things People Do.” And it was on there for two years. People would walk up to me, say “Hey! Were you that goof that…?” — “Yeah that was me. That was me.” That was also in ‘81, incidentally. Dr. L: That was in ‘81? Dr. K: That was in ‘81. Dr. K: That was November of 1981. Dr. L: Has that made it on YouTube yet? Dr. K: No but I do have… see this was before everyone had V.C.R.s and stuff and the only video that I have, which I have is the… I’m not sure what you call it… 3/4 tape that the lady from the Cape Girardeau station sent me. This big, huge canister of like a video tape. Dr. L: Yeah I know what you are talking about. Dr. L: You have nothing to play it on probably. Dr. L: You probably have nothing to play it on. Dr. K: Well, but I can have someone else who can pull it off there. You have to have the equipment to convert it, you know, into something that I could use now. That was… I’d looked at that actually, number of years back when they… when someone else played it. I don’t have a copy of it but someone else, some other T.V. station found a copy and I saw it. And, boy when I see how much I’ve aged I can’t stand it you know. Dr. L: It’s painful to watch, huh? From many levels. Dr. K: I’ve always been painful to look at but I was at least younger then. Dr. L: I want to let you know I did a little digging to prepare for our interview. Not only do I own the three books… I guess I’m one of the few that owns the cat book…. but, I also recently acquired a used copy of — because I think it’s out of print — of a book that you authored called Sam Donaldson’s Toupee and Other Material Off the Top of My Head. Perhaps a PG-13 rated book in some instances. But wow! You have some funny, funny stories my friend. Dr. K: Wait a minute, you bought that book? Dr. K: How did you get it? Dr. L: I got it off of Amazon. Dr. L: No recently. It was used and it was about sixty-three cents. Dr. K: You know I’ll tell you something. I pulled it off the market on purpose. I got, literally, hundreds and hundreds of calls for that one. You are the only one that I know was able to buy it off of Amazon. Dr. L: There was only one copy available. It’s gone. I have it. Dr. K: Ok, I will tell you what, I have backorders for literally hundreds of those books, and I’m not going to sell them. I’ll tell you why. First of all, it was sort of like a bored time of my life that I had to sit down. I wrote a lot of those stories on the airplanes between seminars. And yeah, I got a great review from the Miami Herald on that book. It said, “If you want to read the most disgusting tripe you ever want to read in your life, but entertaining, get this book. Dr. Kamen apparently has no shame. He doesn’t care who reads it or what happens to him. ” I’ll tell you what happened. I’ll tell you what happened. I’ll tell you how valuable that book is. Maybe not so much in money wise. Two state boards heard about that book, one of them being my own state. And there’s a story in there where I tore them apart, the Department of Regulation. I had some fun with them. And no one likes to be made a fool of, obviously. And they wanted a copy of that book so what I did was… I’m surprised this is the first that I’m hearing that anyone else has a copy I mean that’s a chiropractor. I bought up all of the remaining books on Amazon and Barnes and Noble, just so he couldn’t get his hands on it. He called me up for like… for like almost a year . I mean like not everyday, like maybe four or five phone calls. Wanted a copy, to get his hands on that book. You know, one of the investigators. I never gave him the satisfaction of getting it and he’ll never get one. Unless, of course, you now give it to him… I hope you don’t. Dr. L: I wouldn’t, no!… It’s valuable. I found it on the used market. So I mean it’s possible that it could be circulating in some used circles. Dr. K: There is a number of people that do have them but they are hanging onto them though. Dr. L: Well now I know. Dr. K: I hope you were amused by at least a few of the stories. Dr. L: Oh absolutely… and you know I can’t say I read every single story but I did find all the ones that pertained to chiropractic for our interview. Dr. K: Yeah well there’s a lot that don’t. Dr. L: Yeah, I know! Dr. K: …although only two stories there about him. The rest is about everything else. Dr. L: You tell us why you no longer publish your office phone number in your books. Dr. L: Because of some sort of cat story. Dr. L: Can you tell us a little bit more about that? Dr. K: Yeah. Very few people bought my cat book but the ones who did called me, and they’re very surreal phone calls. Like one time I got a call shortly after the book was published many years ago. And I get a call and I hear this lady goes “Is this Dr. Kamen?” I go, “Yeah.” And then all of a sudden I hear a blood curdling scream in the background going “RRAAAOWW! I’m on page sixty-three of your book. RRRRAOOW! And I’m trying to do this…” And I said, “I can’t see what you are doing but stop it. It looks like you’re killing your cat.” And I didn’t memorize the cat book pages and stuff. And so, you know, someone’s cat can die of a misprint. I mean… if they are following directions on the phone, you know I mean… So I used to get a lot of calls like that. Dr. L: Oh that’s fun! Okay I want to shift gears. I often times will enlist the help of my children to ask some questions. Dr. L: I have six children, and listeners of Spinal Column Radio know that you know, we often times will talk about who the interviewee is going to be that’s coming up on our show. Paige Lamar: Hello Dr. Kamen, this is Paige Lamar. My question for you today is have you ever been hurt while adjusting an animal? Dr. K: Yes! I have! In fact, the worst injury… well, I was never seriously hurt. I’ll just start with that. The worst injury that I had was… I was knocked out. I was working on a horse and I got head butted. I was doing a cervical move. I was adjusting the first neck bone below the skull and I wrapped my hands around the horse’s neck. And I was distracted for a second and the horse swung around and literally knocked me out with his head. And I was on the ground for about it seemed to me like hours but the owner of the horse said that it was just a few seconds. But when you are unconscience, seems like hours. You have no conception of time. But yes, head butted. Dr. L: Oh man, a little work comp there huh? Dr. K: Well, I’ve been kicked too but the worst one was probably the head injury. Logan Lamar: Hi Dr. Kamen. This is Logan. What was the scariest animal you have ever adjusted? Dr. K: What was the what most? Dr. L: The scariest animal. Dr. K: Scariest animal? Well, aside from the giraffe, I would say the scariest animal… well, you know what? I’ve adjusted some scary horses. There are some horses that I have adjusted that you simply cannot get near because they’re just so rank. I mean they were either abused someone or their owners and they don’t trust people and you can’t get near them. That aside, the scariest animal that I thought I was adjusting was a lion, in fact. I adjusted the lion under heavy sedation,… and so was the lion. I was in there… they were performing another procedure. They were doing like a nail clip and whatever it was. Nothing happened. I mean it’s… you know… the lion was in perfect control and there was never any fear of anything happening. But it’s a very very bizarre experience to have your hands around a lion’s neck knowing that it’s a lion. And it has this really big, you know, heavy breathing sort of like, you know… His lungs expand you feel that you’re not safe even though that he was under sedation. But, I guess that was the most scariest that I thought but in reality the giraffe was because I was terrified… for real. Dr. L: Ok, well I’m seeing that this is one of the problems with pre recording some questions… because you have already kind of answered some of them. I’m just going to go ahead. We’ll play them through. This is Claire. She is my eight year old daughter. And she has a question that’s kind of like the on you’ve just answered Let’s go ahead and play it. Claire Lamar: Hi Dr. Kamen. This is Claire. Have you ever adjusted a tiger? Dr. L: So have you ever adjusted a tiger? Dr. K: Um no, but the closest one of course then would be the lion. I’ve adjusted some cats who thought they were tigers. And who, you know, try to claw me and all that kind of stuff but no… no tigers. I know other chiropractors who have. In fact, what’s his name? Dr. Michael Gleeson. I don’t know if I can mention his name. I just did. Dr. K: Dr. Michael Gleeson, he was the chiropractor that I sort of mentioned in the earlier part of the interview who adjusted a lot of animals at the zoo in California. Not sure which zoo, in fact, but I know that he has and other chiropractors have. He is noted for that. Molly Lamar: Hi Dr. Kamen. Have you adjusted horses and giraffes? Dr. K: Yes, but not on the same day! Dr. L: Not on the same day… Well here is a question since we are kind of talking about some, you know, odd animals. Have you… is there an animal out there that you have not adjusted that you would like to? Dr. K: Well, maybe just on a dare. Someone asked me to adjust their ostrich. Now, I’m not going to do it. And that sort of kills the last part of your question that “I would like to do.” I said that I would do it. In fact there’s a fellow — (I haven’t talked to him in years. And I don’t even know if he is still around but he was a couple of years ago.) — In Lake Zurich, IL, not far from where I live, he has a car dealership… a used car lot that was getting vandalized. Instead of a watch dog, he had a “watch ostrich,” and his vandalism rate went down. His robberies went down and stuff. Because people were afraid of this gangly-looking, menacing — you know — bird… that has razor sharp toes… that you cannot give it a hunk of meat to… to bribe it like, you know, like you can a dog. And so, there you go. Clayton Lamar: Hi this is Clayton Lamar. Have you ever adjusted a monkey? Dr. K: I couldn’t catch that. Dr. K: Oh! Yes in fact I have! Dr. K: Funny you should mention that. Yes, in fact I was at another sort of like an animal broker’s place. In fact there is a picture of me adjusting the monkey. I would say, in all fairness to the monkey, he adjusted me. The monkey climbed up on my lap, and they think that you are playing with them. You can’t tell them to sit still. And you can’t tell them to relax. The problem with adjusting a monkey is that they’re extremely intelligent and without saying anything they question everything you do. If I had my hands on their back they would flip around. You can’t keep them still. You would have to… I don’t know, you would have to have a veterinarian there to give them some sort of relaxer… tranquilizer in order to do that. But yes, I’ve attempted to adjust a monkey and with very minimal success. Dr. L: That’s fantastic! He’s going to love to hear that answer. So, let’s say I am an animal owner, and I’ve listened to this podcast. I’m interested in getting my pet adjusted but perhaps the “do-it-yourself” thing isn’t my bag. What would you recommend? Dr. K: Well, you can try to find an animal chiropractor in your area. There is a website which is animalchiropractic.org. That is the website for the American Veterinary Chiropractic Association, and they list all of their current certified animal chiropractors which are… which some of them are veterinarians, some of them are licensed human chiropractors — almost exactly half and half. They list them under “referrals” online, and they sort them out by state. So you can try to find one there. There’s other sources. You can call Parker College…. They have a list of theirs’. Then if you are a horse owner you simply can go to the local tack or saddle shop and a lot of them have their business cards. A lot of the chiropractors, who do it, have their business cards there. Dr. L: Ok, perfect. Why don’t y ou tell our listeners about your website and what they could find there? Dr. K: Well, my website is animalchiropractic.com. That is my most up to date animal chiropractic site. I list the few seminars that I do now. I don’t do many animal chiropractic seminars anymore. I used to do thirty a year, now I do like four or five a year. I also have video clips which anyone can watch right now — about thirty-six or thirty-seven — very short YouTube video clips of the adjustments. Of horse and dog adjustments and you can see what they look like. I put those on there for people who are not sure if they want to take my course, and then want to know what they are getting into beforehand… so I show them what the moves look like. Dr. K: …you can get those there too. The Well Adjusted Horse, Dog. and Cat. Dr. L: So those books are available on your website? Dr. K: Yeah… yeah they are. You can get them at all your bookstores. Mostly online. Some of them carry it some of them don’t. By the way, I have a sort of a free gift for your listenership too. Dr. K: Which they can download. I have on another website an eighty page, it’s a complete eighty page “horse chiropractic workbook” with all the technique and pictures and step-by-step explanations on how to do the moves which they can download right now. Dr. L: Fantastic! How do we get that? Dr. K: And the website is… I have a site where I sell a cold laser for animal use. You know, a low level laser. It’s called Vetrolaser, V.E.T.R.O.L.A.S.E.R, Vetrolaser.com. And you can scroll down to the bottom of the first page. You know bottom of the opening page and then it will say “workbook download”. And it’s the complete workbook that registrants get with my seminar. In fact I think it’s more than eighty pages. A lot of it is like forty pages of diagrams, even more than that with every move separated by… I mean they’re organized by the part of the body. All the cervical moves, thoracic, lumbar, extremities and so forth. And in the front of the book , of the workbook, it tells you exactly how to do it — all the moves. This is the book… this is the workbook they would take to the barn with them in the absence of the DVD. Dr. L: Ok, well we will go ahead and we’ll put all those links in our show notes if you didn’t catch that. And you’ll have to let me know how that does. Dr. K: Ok, yeah, I get a lot of people downloading that workbook. Dr. L: Well we are just about at the end of the interview. I’m going to give you the last word. Is there anything you wanted to say that we haven’t touched on? Dr. K: Yes! There is something that I would like to say. A lot of chiropractors, especially chiropractors these days — and this may be more or less a controversial statement — but a lot of them are getting into Animal Chiropractic maybe for the wrong reason? Because of the economic times a lot of the insurance companies are not treating chiropractors as well as they used to as far as reimbursements. So, they want to find other revenue resources which would be of course adjusting animals. And they think it would be a very neat thing to get into, animal adjusting especially horses. And they can do very well. The thing is, is you have to like horses. You can’t be afraid of horses. You have to know a lot about it. You also have to check your state laws. So, it’s not that easy. I’ve known chiropractors that out of desperation, maybe things weren’t going very well in their practice and they want to start adjusting animals and things were going fine until the state shuts them down or they have a mark against their license. Just to the chiropractors I would say: Go into this with your eyes wide open. Call your veterinary board. Call your state chiropractic association and take a long course in Animal Chiropractic. I only offer a quick technique course which is good for chiropractors who already know about chiropractic and horse owners who want to adjust their own horses. But, take the long course. Take Parker’s course. That’s the best course in the country. 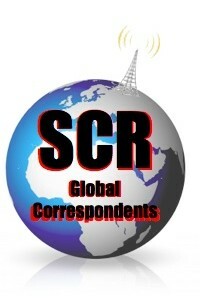 Dr. L: Dr. Kamen I want to thank you for agreeing to come on to the world famous Spinal Column Radio. I realize that our show is very very small in comparison to some of the shows that you’ve been on in the past, but you so graciously accepted my invitation. 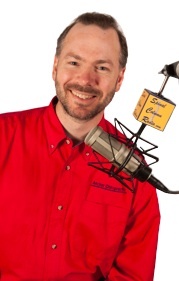 And here on Spinal Column Radio, one of my goals is to showcase what I call “Extraordinary Chiropractors Doing Extraordinary Things.” And I’d say that you easily fit that description. Dr. K: Well, thank you! Dr. L: You are in many ways a torch bearer for Animal Chiropractic, and if it wasn’t largely for your efforts and people like you — and of course the shoulders of those you stand on before you — Animal Chiropractic could easily vaporize. I want to thank you for keeping Animal Chiropractic alive and as a viable healthcare option for pet owners everywhere. Dr. K: Well, thank you! I appreciate being on your show and, by the way, a small audience is a very dedicated audience. Even one person is important. So, I’m glad to do it. Dr. L: Absolutely, well said. Thank you Dr. Kamen. Dr. K: Thank you very much. Dr. L: Dr. Daniel Kamen… an all around fun interview. By the way…. I don’t know if it was obvious in the interview, but Dr. Kamen is also a human chiropractor. Although he shared with us before we started recording that he is winding things down now as he looks to retirement and has consequently closed up his human shop. Now he’s exclusively working with animals… adjusting horses and teaching his seminars…. but, as he stated in the interview, he’s even slowing that down a bit as well. Well… Logan what did you think? …I thought we could talk abou the interview a bit… do you have any thoughts? Logan: Well I thought is was pretty cool. Did you actually go to one of his seminars? Dr. L: You know, I did. Acutally it was the first post graduate course that I took right out of chriopractic college. The subject matter of Animal Chiropractic… it has always fascinated me — and continues to, to this day. It was something that was really never talked about in chiropractic college. So, as soon as I graduated — and I saw a postcard come through the mail for Dr. Kamen’s course — I signed up immediately. 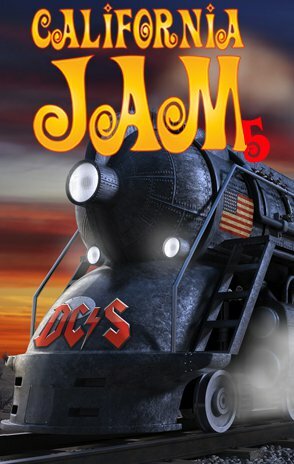 And this would have been in the first part of 1996 — I believe it was March of ‘96 — and it was in Anaheim, CA…. actually pretty close to Disneyland. The class was composed of about half chiropractors and half veterinarians. I’ll never forget coming home after the course…. Logan: Oh yeah… I like this story. Dr. L: You remember this story, okay. Well I want to tell the listeners…. Well, I walked through the door, and I didn’t even stop to kiss your mom on the cheek. I was on a mission: where’s the dog? We had a very hyper Cocker Spaniel named Rusty. Rusty was acutually a pretty large Cocker (as Cockers go). He was the kind of dog that you didn’t take for a walk… he took you for a walk. Needless to say, we had him on a choke chain…. and as I learned, from the course, dog’s necks really aren’t that much stronger than ours…. so you can imagine what the yanking of a chain around a dog’s neck can do over time. So, I went up to our dog and immediately began evaluating his neck. Sure enough, he had a subluxation in the upper-most neck vertebra — called the atlas. I set up on it, and then adjusted it. To this day, that was the loudest “pop” that I’ve ever heard come out of a dog’s neck — even your mom heard it, and she was completely on the other side of the room. And, I’ll never forget… Rusty just stood there motionless for what seemed like, perhaps, three seconds… just staring at me. And then he started wagging his little stub tail a million miles per hour. He was so happy! Logan: Didn’t you also adjust your cat? Dr. L: I did! I also also adjusted Sam, our cat. And as Dr. Kamen alluded, cats are very different. Cats like to attack. So unless the cat is in a very relaxed state, it’s difficult to get the adjustment. Well, Sam happened to be in one of her, what we liked to call, “liquid kitty” moods one day — that’s when she’s lying on you and she doesn’t move. You move a bit and she moves with you… kind of like a water bed. She’s kind of there for the ride…. anything goes. Anyway, I figured this was my opportunity. So I palpated the vertebrae in her neck and found a notable restriction… and so I delivered a swift adjustment. Immediatley, Sam began to lick my hand with her sandpapery tounge…. not once or twice… but profusely, as if she was showing gratitude. Logan: Wow! That’s pretty good. Dr. L: Oh, I have one more story that you’ll probably like, and then we’ll wrap things up. Actually, you were there… but probably don’t remember. You were probably five years old or so. We were sitting at the dinning room table when a small bird — like a sparow– slammed head first into the sliding glass door and dropped on the deck…. Dr. L: Yah… “Ouch!” is right. You and your sister were very sad… because the bird, it just lay there motionless. It looked dead. So… “Daddy do something!” So I went outside and I picked up the bird — and you guys were looking at me through the window — and I was like, “Oh man, this bird looks dead.” … but I could tell that maybe it was just overly stunned. And so, I put my fingers on its really thin “bird neck” and just kind of started to move the vertebrae… just kind of giving it a massage and mobilizing those joints. And then the bird just perked up — immediately! Logan: Ya! That’s really cool! Dr. L: Ya, I know. Actually I don’t think I can take all the credit. But it was fun to pretend like I had done something. Anyway…. Logan, what did you find interesting about the interview with Dr. Kamen? Logan: Well, I thought it was pretty interesting about the fact that he actually adjusted as monkey. Dr. L: I know! That was Clayton’s question. Logan: Ya, he hasn’t gotten a question answered on an interview yet. Logan: So what about you Dad… What did you find interesting? Dr. L: Well, you know, I was pleasantly surprised at how much Animal Chiropractic has progressed — at least in terms of education and awareness — over the past 14 years. 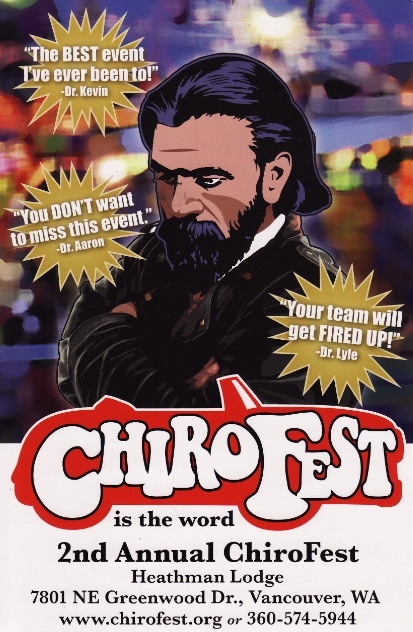 I think it is great — absolutely great — that Parker College of Chiropractic, which is in Texas, has Animal Chiropractic as part of their cirriculum and that Animal Chiropractic is no longer “stuck in 1895.” Clearly, as Dr. Kamen has said, it still has a ways to go as far a getting all of the laws out there to kind of “synch up,” but, never the less, it is advancing. And I just thought that was great. Well you know Logan this episode breaks the record as being our longest episode yet… but, it just didn’t feel right to break it into two parts. Hey, I wanted to let our listeners know that all of the episodes — including this one — are transcripted, and we have those available in our Show Notes on our SpinalColumnRadio.com website. If you don’t see them — when you go to the Show Notes — look for the word “Transcript” at the bottom and then click the “more” link. And as a little enticement to go check themout today, I’m going to put [in the transcript section], kind of, a “bonus picture” that Dr. Kamen sent me. 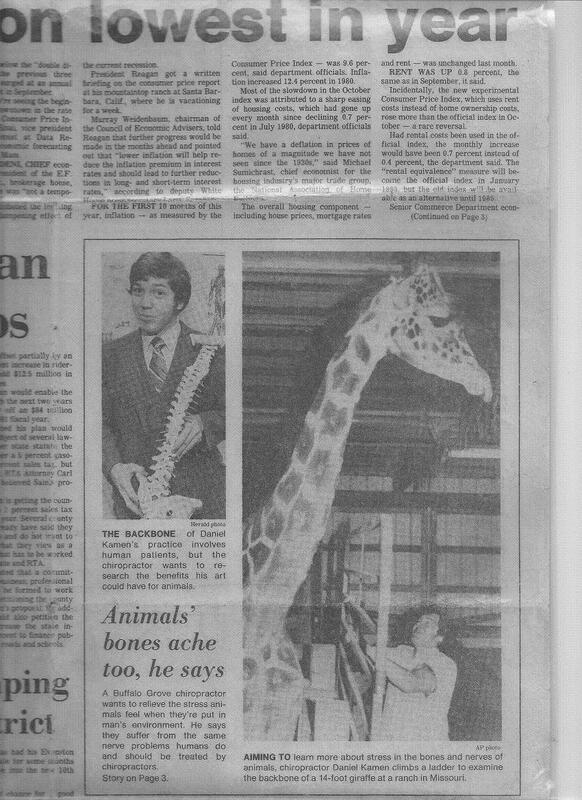 He dug through his scrapbook and found a 1981 newspaper clipping of a very young looking Dr. Kamen adjusting a very tall giraffee. So go check that out. Dr. L: And As promised, we’ll be putting all of the links that we talked about in today’s show in the Show Notes as well… including the “free gift” that Dr. Kamen spoke about… plus I’ll be auctioning off to the highest bidder, my personal copy of Sam Donaldson’s Toupee and Other Material off the Top of My Head….. Just kidding. Well, that will do it for this very lengthy episode. Thanks again to Dr. Daniel Kamen and thank you for listening right up to the end. Hey, before we box up the Animal Chiropractic topic…. we have one more interview that you abosolultely won’t want to miss. Let me get through the disclaimer, and I’ll tell you more…. Spinal Column Radio would like to remind you that true health comes from the inside out — not outside in. As such, the content of this particular podcast, along with the show notes and related links, is not intended to cure, diagnose, treat, or prevent any disease in your pet. But, instead, is meant to inform and inspire you in asking better questions when it comes to the health of your pet. Since the circumstances surrounding your pet’s situation are unique, you are encouraged to consult with a Doctor of Veterinary Medicine and/or Chiropractor professionally trainned in Animal Chiropractic . Next time on Spinal Column Radio, we’ll have a conversation with West Yellowstone, Montanna chiropractor, Dr. Kyle Goltz…. who — just two months into his career as a chiropractor — helped a patient named Fred with neck pain. But, as you’ll soon find out… Fred was no ordinary patient. That’s in two weeks…. Logan: Woa… Woa… Woa… Woa… Wait a minute! Aren’t you going to tell them who the patient was? Dr. L: Stop the music….. [outro theme music stopped] I don’t have much time. [burst into laughter]. No I’m not going to tell them! I want them to listen. That’s what a “teaser” is all a bout. Dr. L: It’s “radio stuff”… okay? Dr. L: Okay. Start the music back up. [outro theme music resumed] ….So, until then, for my son Logan, tweaking the knobs on the mixer board, this is Dr. Thomas Lamar, your podcast chiropractor. This episode was exceptionally enjoyable and had me laughing pretty hard at times. Thank you Dr. Lamar and your family (Logan) for putting this wealth of knowledge and material out there for anyone to enjoy. It is very refreshing listening to how close you involve your family with your show. I come from a large family myself and enjoy listening hearing your children’s voices/ My wife and I are expecting our second any day now and God willing these two are just the beginning. Phil what a delight to get your comment today. I’m so glad that Patrick pointed you our way! I love the medium of podcasting. To think that you are enjoying an episode I recorded nearly two years ago is pretty darn cool…. and that fact that you are doing it on your own time to make your commute more enjoyable is fantastic… AND you are half way around the word… even more AMAZING! I too enjoyed interviewing Dr. Daniel Kamen. He’s a pretty funny guy and one who has done a lot to advance animal chiropractic. So glad that you want to become a chiropractor. I am blessed to be able to bring prospective chiropractors, like yourself, the true message of chiropractic as we interview some of our professions greatest. PS. If animal adjusting interests you…. you need to listen to episode 016! … you might also find episode 095 interesting as well.